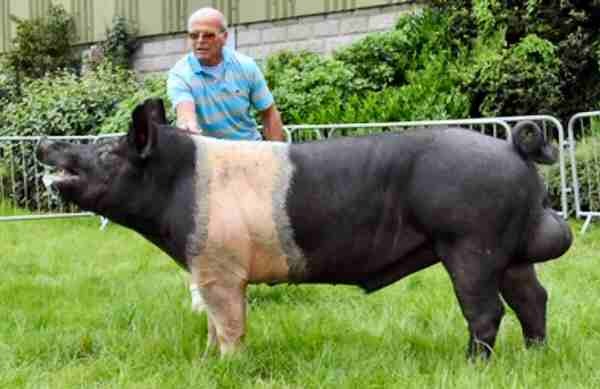 The Hampshire breed was developed in Kentucky, USA, and is thought to have derived from belted pigs originating from Wessex, England, in the early 1800s. It became one of the breeds of pigs in the USA that went on to have a significant impact on pig genetics throughout the world. 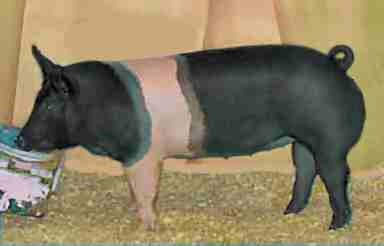 In the early 1900s the Hampshire was one of the predominant breeds in the USA, used for the production of both pork and bacon. The breed is most notably known for its large size, prominent white belt and erect ears, as well as its production characteristics. Today the modern Hampshire has a good reputation for hardiness, large litters, good growth rates and very lean carcasses. The Hampshire also became well known for its ability to produce lean carcasses in crossbreeding systems, and is often regarded as a premier terminal sire. Worldwide the numbers of Hampshire pigs are still high, although in New Zealand their numbers have remained relatively low as they have not been as popular as the more traditional English breeds. Go to Hampshire Standard of Excellence.